The Sylvia Plath 75th Year Symposium programme was updated today. See below. Abstracts and biographies are online now at the Symposium's website. Click the link for the "Full Programme" to download/view them. Sutton Publishing of Stroud, Gloucestershire, is issuing Judith Kroll's Chapters in a mythology: The poetry of Sylvia Plath in its first UK edition. This edition includes a new, long Foreword by Kroll. Word on the street is that Sutton is trying to have the book available at the Sylvia Plath 75th Year Symposium; so in addition to your well-read US copies, be on the lookout for this item. There is space on my bookshelf for it, how about you? Sutton also published Lynda K. Bundzten's eye-opening work, The Other Ariel (2003) and Ronald Hayman *%^$&#* biography, The death and life of Sylvia Plath (2005). The one actress play Edge, about Sylvia Plath, written and directed by Paul "Rough Magic" Alexander and starring the lovely Angelica Torn, is now on the Theatres at 45 Bleecker Street, in Manhattan's East Village. The theatres are located on the north side of Bleecker Street, between Lafayette & Mott Streets. Tickets are $35 - $45, the telephone number is 212/239.6200. Performances are Thursday - Saturday at 8pm and Sunday at 3pm. The play lasts 2 hours, 15 minutes and has one intermission. For more information, please visit the Edge web site. The Manuscript, Archives, and Rare Book Library at Emory University recently posted a new collection to WorldCat, the "Selden Rodman collection, 1938-1959". "The collection contains correspondence, poetry, writings, and printed material collected by Selden Rodman from 1938-1959. The collection focuses on Ted Hughes and W.H. Auden, and includes handwritten and typed drafts of poems by Hughes and Auden, correspondence to Selden Rodman, writings by Rodman concerning Auden, printed and manuscript drafts of reviews by Auden, and newspaper clippings. The collection also includes two typewritten poems by Sylvia Plath. The collection sustained heavy fire and water damage prior to acquisition. Some items are not fully intact or may be difficult to read." According to the staff at the Manuscripts, Archives, and Rare Books Library, the two poems are "Full Fathom Five" and "Sculptor". Selden Rodman is not a name I know; has anyone heard of him? Yale University also owns some Rodman papers, and they have a succinct biography of him here. Having trouble deciding which of the concurrent sessions to attend based solely on title/topic? Well, your decision just got easier! For those attending, or wishing they were attending the Sylvia Plath 75th Year Symposium, which starts in eight short days, the abstracts and biographies of Symposium participants have been posted to the Symposium's main web site. To read them, click the link just above and then click Full Programme. Today is a good book day!! In addition to Eye Rhymes: Sylvia Plath's Art of the Visual, the Letters of Ted Hughes, edited by Christopher Reid, is now available, according to Waterstones and other UK bookshops. Recently, the Telegraph online serialized excerpts of Hughes's letters regarding Sylvia Plath. This promises to be an invaluable addition to Plath and Hughes scholarship. Amazon.co.uk, and other UK bookstores, list that Eye Rhymes: Sylvia Plath's Art of the Visual is in stock. A new schedule is available; see posting on 19 October 2007. The Mount Holyoke College Archives and Special Collections, featured in posts on 21 June and 27 September, have a selection of images available online as part of their digital collections. As part of their Glascock Poetry Contest records, they have made available two photographs of Plath. One is from 1955, as a contestant. The second is from 1959, as a judge. Provided that the links stay consistent, if you click here you will see a search result for the word "Plath". The 1959 picture was new to me; the 1955 is amongst my least favorite and likely the least flattering photograph of Plath out there. If the link above does not work, this one should take you straight to the 1959 image. If the link above does not work, this one should take you straight to the 1955 image. On 18 September I posted about Sylvia Plath broadsides. I referred to a broadside of a poem entitled "Pigeon Post". On a recent visit to Smith College, I found this poem in the working papers for Plath's Collected Poems. These working papers contain all known versions of Plath's poetry, either in typescript or printed version. It's a very remarkable part of the collection that I didn't know existed. The typescript indicates this to be a poem belonging to the 'Cambridge Manuscript', poems Plath submitted as part of her final examinations as a student at Newnham College, Cambridge University. This dates the poem between 1955 and 1957; but as it was not included in The Collected Poems, it can be presumed to be from 1955. Only three libraries list themselves as owning this broadside, the University of Chicago, Princeton, and Cambridge University. I obtained a high quality digital scan of the broaside in the mail the other day. It's the poem, centered on the page, on a blue background. There are no other images. The copyright statement reads, "1993 Frieda and Nicholas Hughes". Underneath that is the Turret logo and the following text, "Published by Bernard Stone and Raymond Danowski. The Turret Bookshop, London May 1993". beyond life's wall to bring me word. Sylvia Plath's Art of the Visual is the title of an event taking place on Wednesday 28 November 2007, 7:45 P.M, in the Purcell Room at the Southbank Centre in London. Tickets are £10, with a limited number available at concession rates. In this unique, illustrated event, artist Stella Vine joins playwright Elisabeth Gray and poet Clare Pollard to discuss what Sylvia Plath means to them, her continuing legacy, and their perspectives on Plath in the light of these new discoveries. The event is chaired by Sally Bayley. Sylvia Plath’s position as a cultural icon and as a hugely influential writer is unassailable. With the publication of Eve Rhymes: Sylvia Plath’s Art of the Visual, co-editors Kathleen Connors and Sally Bayley present fascinating new material about Plath as a painter and as a reader, and how these influenced her development as a writer. This is part of the Gender Studies Public Events Series sponsored by Cambridge University Press. Update: Eye Rhymes: Sylvia Plath's Visual of the Art is shipping from warehouses across the United Kingdom on Monday 15 October, 2007. Look for it in bookshops by mid-to-late week! On 14 October, just three days from now, Al Alvarez, Kathleen Connors and Diana Quick will be discussing Plath in different ways. Special Note: Eye Rhymes: Sylvia Plath's Art of the Visual, edited by Kathleen Connors and Sally Bayley will be on sale at the event. Another Plath manuscript formerly for sale was "SYLVIA PLATH VI POEMS. (A.M.S., autographed manuscript signed)." This notebook, described in detail below, sold several years ago. The bookseller recently advised me that it may have gone to an institution in New York, though he is unsure which one it may be. I've searched the catalogs of Cornell, Columbia, and NYU, as well as WorldCat and found nothing. If anyone has worked with or seen this notebook, the Loch Ness of Plath manuscripts, please let me know! Paragraphs added by me. "Wellesley, MA: circa 1944-45, original notebook, signed, ruled pages wire-stitched in original cloth reinforced red paper covers. The title "Sylvia Plath VI Poems" is written in the author's hand on a white label with double ruled red border, and applied to the upper center of the front cover. "The following description is taken from the letter of authenticity which accompanies the notebook: "Sylvia Plath created this notebook of favorite poems and schools exercises while in the sixth grade at Marshall Perrin Elementary School in Wellesley, Massachusetts during the 1944-5 school year. It is entirely in her holograph and a gummed label on the upper cover reads 'Sylvia Plath VI Poems.' This remarkable piece of Plath iconography includes seventeen (sic) copies in a fair hand of some of her favorite classic poems, from Emerson, Masefield and others. Her school exercises, including lists of spelling 'demons,' holidays, birthdays of significant people, etc. show much personal precocity. In fact, at this point in her life she was unusually happy and highly successful in school, being of extraordinary creativity and intelligence. . .and this seminal artifact of her youth is a missing link to the final terrible genius of Ariel. . ."
"Of particular interest is the neat and orderly text, along with the uniformly attractive penmanship of a sixth grade girl. Her choice of poems, lyrics & prose pieces (totaling nineteen pages) along with her appliqued embellishment of Emerson's "Concord Hymn" are intriguing. There are copious lists of geographic locations, earth formations, famous birthdays, holidays, and perhaps the most insightful and curious is her list of "100 Spelling Demons". This glimpse into the early development of Sylvia Plath, touching directly both her academic and creative spirit, is a unique window unavailable elsewhere. The physical notebook shows very little wear, and is in remarkably fine condition. One of a kind." The list price on this item, $19,500, was well below that of the Corrected carbon typescripts of Ariel. This item is contemporary with the poems held by the Morgan Library, New York. Oxford University Press has updated the publication date for Eye Rhymes: Sylvia Plath's Art of the Visual. Look for availability around 18 October 2007; or, just eight days from now! Eye Rhymes will be for sale at the Sylvia Plath 75th Year Symposium. In the US, look for availability in December. Plath's Ariel manuscripts are held mostly by Smith College. As I reported here, the Houghton Library and Woodberry Poetry Room at Harvard hold "Tulips". The recently published Ariel: The Restored Edition is a blessing to Plath scholars. The addition of facsimile typescripts gives the reader an idea of the holdings; though, seeing the real thing cannot be matched. One day, maybe all of her typescripts in facsimile will be available commercially. Not too long ago the following collection of Ariel typescripts was for sale. In the book world, literary manuscripts are among the rarest of the rare as well as the biggest ticket items. There are a couple of manuscript poems by Plath from the 1940s for sale ("Snowflake Star" and "The King of the Ice"). However, in the last five years or so, two sets of poems were on the market. This post will cover a very rare, interesting set of Plath's Ariel poems that was for sale but was recently removed from the booksellers' online catalog. According to the bookseller, the typescripts sold about six months ago to a private collector. The description (I've added paragraphs breaks for flow) of the collection is as follows. "Plath, Sylvia (1932-1963). Corrected Carbon Typescripts for Ariel. 1960-1962. Seventy-five quarto sheets, text on rectos only. Original corrected carbon typescripts for forty poems, twenty-eight of which were published in Ariel (1965); the remaining twelve poems were published in later volumes. The title poem, "Ariel," bears a highly significant and previously unrecorded holograph dedication: "For Al [Alvarez]." Fifteen of the poems have been annotated by Plath in the top right-hand corner with the names of the journals and magazines which had accepted her poems for publication. Most of the poems bear numerous autograph corrections of accidentals throughout (mostly changing colons to periods). "The present group of typescripts is almost certainly another copy of the carbon typescripts which Ted Hughes mentions in "Publishing Sylvia Plath," as being the scripts from which he selected the poems to be published in Ariel: "She left behind a carbon typescript, its title altered from Daddy to Ariel, its pages littered with minor corrections, containing about thirty-five poems, beginning as now with "Morning Song" and ending with the Bee poems . . . It began with the word "love"` and ended with "spring," as she pointed out . . ." Hughes discusses the same typescript in his introduction to Sylvia Plath: Collected Poems: "Some time around Christmas 1962, Sylvia Plath gathered most of what are now known as the "Ariel" poems in a black spring binder, and arranged them in a careful sequence. . .This collection of hers included almost everything she had written between The Colossus  and July 1962 -- or two and a half years` work." "In her biography of Sylvia Plath (Bitter Fame, 1989), Anne Stevenson suggests that Plath may have rearranged the text on 15 November 1962: "It contains "Death & Co.," written the day before, but no poem written later. . .The manuscript [i.e. the text] had already been through earlier revisions; there were former titles crossed out on the title page, and the order of certain poems changed, with several of them corrected by hand." It seems from these descriptions of the typescript that both its contents and its sequence match those of the present series (although "The Swarm" is missing here). It also seems likely that, having gathered the carbon typescripts in the black binder and into what was to be the "final" typescript for Ariel, Plath then annotated the present carbon copies with the names of the journals, her typing corrections and the dedication of "Ariel" to Al Alvarez (the last presumably in or after December 1962). This dedication to Al Alvarez, at that time literary critic for The Observer, is particularly striking in view of the relationship that seems to have grown up between him and Plath during the winter of 1962. In December she had "got in touch with Alvarez to show him the completed manuscript of Ariel. . .Very probably Sylvia was looking for a new man in her life, a relationship that would fulfill her emotionally and intellectually and restore her pride. . .A. Alvarez may well have been Sylvia`s first choice. He was influential, amiable, and attractive; clearly he admired her and fully responded to her new poetry. In his memoir Alvarez implies that his relationship with Sylvia was no more than literary, yet he confesses frankly to a bleak feeling of having let her down." (Anne Stevenson, Bitter Fame, 1989). Alvarez himself comments in The Savage God, 1971, on his initial reception of Ariel and Sylvia Plath`s response: "I told her it was the best thing she had done and a few days later she sent me a fair copy of it, carefully written out in her heavy, rounded script, and illuminated like a medieval manuscript with flowers and ornamental squiggles." "Ted Hughes explained why the Ariel published in 1965 was different from the volume Plath herself had planned. It contained the poems she had written in 1963 and omitted "some of the more personally aggressive poems from 1962." The published Ariel was his "eventual compromise between publishing a large bulk of her work -- including much of the post-Colossus but pre-Ariel verse -- and introducing her late work more cautiously, printing perhaps only twenty poems to begin with. "I`m still not sure whether Ariel would not be a better book if I had kept out everything that followed the "Bee" poems, as in her version. She herself regarded those last poems as the beginning of a new book." The twelve "more openly vicious" poems of the present series which were omitted in the final Ariel volume are: "The Rabbit Catcher," "Thalidomide," "Barren Woman," "A Secret," "The Jailor," "The Detective," "Magi," "Lesbos," "The Other," "Stopped Dead," "Purdah" and "Amnesiac." The poem which is usually known as "The Courage of Shutting-Up" is here entitled "The Courage of Quietness." "The journals and publications named on some of the typescripts are: The Observer, Partisan Review, Hutchinson Anthology, London Magazine, New Yorker, Mermaid Festival Commission, PEN 1963, New Statesman, Harper`s and The Atlantic Monthly. Several poems are annotated with the names of more than one journal. Judging from the publication of her poems during her lifetime and after her death, it seems that Plath annotated those poems which had already been accepted by the named journals. Plath spoke of "The Moon and the Yew Tree" on the radio in July 1962, and the BBC recorded her reading of "Berck-Plage" on November 17, 1962 -- both of these poems, as well as "The Rabbit Catcher," are marked "BBC." "Medusa" is dated in Plath`s hand "October 16 1962" it is the only dated typescript of the series. On eleven occasions Plath had difficulty in positioning the carbon paper. This resulted in only the top part of the last line of "Berck-Plage" being reproduced, the last line of "Purdah" being added in ink by her, and the last lines, sometimes three or four, of nine poems being retyped directly onto these sheets. A key document in the emergence of the book which established Sylvia Plath`s literary reputation. The vast majority of Plath`s manuscripts were sold to Smith College in the 1970s with the obvious consequence that manuscripts of any importance are virtually unheard of on the market. We have seen nothing to compare in significance with the present typescript offered for sale to the public." The research value of this collection of corrected carbon typescripts is immense. I am thankful, at least, for such a long narrative description of the collection and do hope it will be available for scholars one day. For more than four decades, Plath's greatest achievement has been her suicide. The focus is displaced, severely, from where it ought to be: on the writing. Certain milestones throughout the decades perpetuated and expanded upon Plath's dark ending. Robert Lowell's introduction to the first American edition of Ariel set the tone, ''These poems are playing Russian roulette with six cartridges in the cylinder.'' His comment is presumably on the poems, but the image reflects more upon her final act. In the 1970s, Plath's fan base grew thanks in part to the feminist movement. However, a vision or label of Plath as a hysterical writer affixed itself to an image of Plath as a strictly suicidal writer. Popular culture refers to Plath in books and television, as well as in the music and film industry. These references continue the stereotypes already mentioned, as a hysterical suicide. Most recently, Fox's House (played by Hugh Laurie) referred to a depressive, pill-popping patient, saying, "You were practically living with Sylvia Plath." Plath scholars have had enough. Around 1998, however, critical attention to Plath began to change. Publication of Ted Hughes's Birthday Letters coupled with the unsealing of some of Plath's journals and the subsequent issuance of an unabridged addition of the journals set in motion serious review of Plath's works and her placement in literary tradition. Of particular focus in this Plath renaissance has been primary source materials. These are her published and unpublished papers housed in three major literary archives at Smith College, Indiana University, and Emory University. These archives hold her poetry and fiction manuscripts, unpublished letters and journals, rarely discussed artwork, other educational effects, and much more. The result of this re-examination will not be a skipping, sing-songy snap-happy Sylvia Plath. Rather, the result of such investigations may be a better understood woman and poet and maybe, if the right scholar(s) approaches the right materials, a better understanding of her life and its conclusion. Anita Helle's The Unraveling Archive: essays on Sylvia Plath is a very welcome and long-awaited addition to Plath scholarship. The eleven literary critical essays examine Plath's work and life and each author's experience using Plath's archives connects and informs their topic. Helle writes, "The collection aims to enlarge and enrich the contexts of Plath's writing with the archive as its informing matrix, unraveling tangled connections...." This aim is very much achieved. Historically, two dates define Plath's writing: 1950 and 1956. Both the published journals and letter start in 1950. Plath's Collected Poems begin in 1956, the year she met Hughes, with a select fifty poems classified as "juvenilia". Even Plath's two major archives divide her life: with some exceptions, the collection at the Lilly Library primarily holds earlier materials and the Mortimer Rare Book Room, Plath's later papers. Plath scholars are no longer content - if they ever were - with the arbitrary division of Plath's writing - and life - into two discrete parts, juvenilia and mature. The essays in The Unraveling Archive look at Plath's total archive. That is, they unite otherwise inextricable collections separated by hundreds of miles. The essays are divided into the following sections (themes): "The Plath Archive" and "Culture and the Politics of Memory." The essays in the first section concern themselves with "newly published, underutilized, and underrepresented material." (8) Tracy Brain, Robin Peel, Kathleen Connors, and Kate Moses examine various aspects of the Plath archive. Brain discusses Plath's Ariel manuscripts and the recent publication of Ariel: The restored edition. In his survey of Plath's political education, Peel continues to draw out Plath's interest in politics, following up on his 2002 book Writing Back: Sylvia Plath and Cold War politics. Kathleen Connors, mastermind of the 2002 exhibition "Eye Rhymes" and co-editor with Sally Bayley of a forthcoming book under the same title, discusses the riches of Plath's visual works, a skill which was highly developed at an early age. Moses draws on the audio recordings of Plath's voice in a variety of poetry readings and interviews conducted from 1958 through early 1963. The essays in the "Culture and the Politics of Memory" section reflect "the opening up of critical approaches to Plath and also the explosion of the canon." These essays explore "works that have received less critical attention" but also drawn on the "heightened awareness of the contexts and settings that have mediated our understanding of Plath's multiple identities." (8) Essays by Sandra Gilbert, Ann Keniston, Janet Badia, Anita Helle, Marsha Bryant, Lynda K. Bundtzen, and Diane Middlebrook each present valuable, critical insight and opinion on Plath's work and literary merit. Each helps to continue a theoretical re-evaluation of Plath's critical reception. Plath scholarship has moved away from over-reading canonized works such as "Lady Lazarus" and "Daddy". Thankfully, there is a movement towards looking at lesser known poems and stories. Each of the essays in the second part examines such works. Gilbert contextualizes culture and history in Plath's 1962 poem, "Berck-Plage". Critics typically pan Plath's use of Holocaust imagery in her poetry, but Keniston attempts to reset this disapproval by assessing a combination of Plath's lyrical technique with her dictionary annotations. Badia looks at Plath's cultural image and interpretation, as well as her status as a cult figure, with particular attention given to her female readers. Anita Helle's essay assesses photographs of Plath as "image events." She also looks at relatively neglected poems such as "The Hermit at Outermost House", "Point Shirley", and "A Winter's Tale", each poem is rich in scenic, photographic detail of places frozen in time and place through Plath's words. Bryant explores the archive of the Ladies' Home Journal, a magazine that published only one of Plath's poems in 1958. The Ladies' Home Journal was Plath's Holy Grail, not just the magazine she most wanted to see her work printed in, but the magazine that also epitomized mid-century American domesticity and what it meant to be a woman in America. Bundtzen and Middlebrook look at the Plath/Hughes creative partnership and poetic influence each had on the other. Bundtzen appraises Plath's poem "Burning the Letters" and Middlebrook compares Plath's "The Rabbit Catcher" with Hughes's Birthday Letters poem of the same name. With some exceptions, I find the essays in "The Plath Archive" more readable than I do those in the second section. However, as a frequent user of the Plath archives and as a one undergoing training and schooling to be and archivist, perhaps my enthusiasm for the first section is not too surprising. All the essays dig deeply into Plath's archives, however, the focus of the essays by Brain, Peel, Connors, and Moses is placed more centrally on the "stuff" of the archive. I find their use of the materials and the presentation of their findings of such immense importance and interest that it overshadows the theoretical approaches applied to essays in "Culture and the Politics of Memory." More attention is given to reading and interpreting what is physically on the page versus the endless, tricky, and interconnecting "discourse" of academic theory. I find that theoretical discourse does much less unraveling of those tangled connections than it purports to do. Also, I have never found this kind of criticism understandable, more my own failing than that of the authors. I have added the third and final link to the Telegraph's serialisation of the forthcoming Letters of Ted Hughes. The letters cover a period from 1969 to 1998, and covers the period of Sylvia Plath publications through the 1970s and 1980s, and through his Birthday Letters. To see the article and excerpts, please see the post from 6 October. As reported earlier today, the Telegraph is running extracts of Ted's letters, with a particular focus on letters to or about Sylvia Plath. For part two, please click here. Faber will release the Letters of Ted Hughes, edited by Christopher Reid, on 1 November 2007. The Telegraph recently ran an article, announcing their intention to print extracts in the coming days. I do quite adore the Telegraphs honesty in pulling extracts, "We have, inevitably, concentrated on the relationship with Sylvia Plath, the subject of an enduringly prurient, non–literary fascination." The mammoth 800-page book will retail for £30.00, but if you buy it early - from amazon.co.uk for example, you could save as much as 50%. Since 2000, large volumes of letters of some of the twentieth centuries greatest poets such as Dylan Thomas and Robert Lowell have been published. These tomes add much to our understanding of the poets lives. A collected letters of Sylvia Plath would be a most welcome addition to this genre. Having read many unpublished letters in the archives held at Smith College, Indiana University, and King's College, Cambridge University, there is valuable, and pertinent information awaiting a wider readership. A volume this size should come with a warning! Tracy Brain is the author of The Other Sylvia Plath (Longman: 2001). 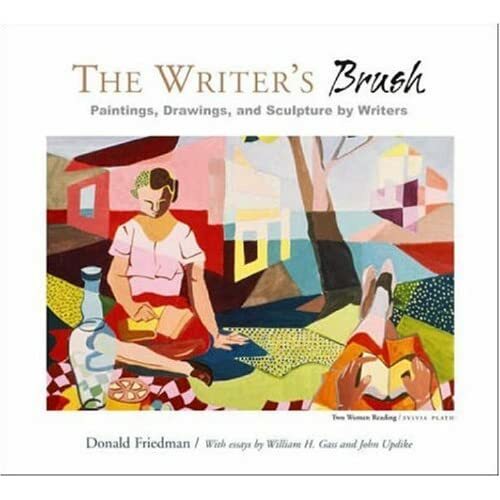 There is a new book out, The Writer's Brush by Donald Friedman. See the link for a complete description of the book. Sylvia Plath's tempura "Two women reading" is on the cover! This book appears to be on sale nationwide. Plath's artwork, and this one in particular, was one of the highlights of the 2002 Eye Rhymes exhibit at the 2002 Sylvia Plath Symposium at Indiana University. Strangely, though, the image is reversed from that which appears on the a web site announcing the Eye Rhymes exhibit. A color reproduction of "Two women reading" also appears in Kathleen Connors essay, "Visual art in the life of Sylvia Plath: Mining riches in the Lilly and Smith archives," which can be found in Anita Helle's The Unraveling Archive: essays on Sylvia Plath. Accompanying the books publication is an exhibit. Currently the exhibit is on at the Anita Shapolsky Gallery in NYC through 27 October, 2007. The exhibit will travel to Cambridge, MA in December. Stay tuned for updates! It is with great sadness that I report here of Elaine Connell's passing on 1 October 2007. I met Elaine in February 2003 and spent a week with her, her partner Chris, and Morgan. It was quite a memorable week; they were very good company and made me feel very much at home. Elaine's book Sylvia Plath: Killing the Angel in the House and the Sylvia Plath Forum are great legacies to the Sylvia Plath canon. Elaine Connell will be missed. Rest in peace. A new schedule was made available on 15 October 2007. This schedule, no longer valid, was removed. Please find below the most recent schedule for the Sylvia Plath 75th Year Symposium. The bibliography of authors participating in the Sylvia Plath 75th Year Symposium has been updated. This schedule is no longer valid. Please see the posting for 3 October. The following is the most recent schedule for the Sylvia Plath 75th Year Symposium, which opens in just 23 days!